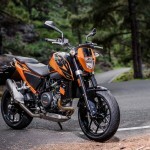 KTM finds itself in the enviable position of having created a popular brand-within-a-brand with its Duke line of motorcycles. Don’t believe me? Take a look at KTM’s 2016 Duke line-up. 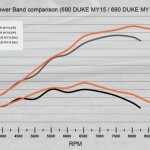 Consisting of six different models (some of which, unfortunately, don’t make it to the American side of the Atlantic), the Duke line starts with the 125 Duke and tops out with the 1290 Super Duke R – yet still has room for a pair of Dukes in the displacement range that started the line in the form of the 609cc 620 Duke I. 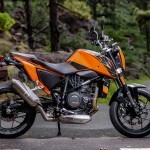 Before we go any further, we need to step back from the current KTM image to remember that, way back prior to 1994, KTM only manufactured dirt-focused motorcycles. 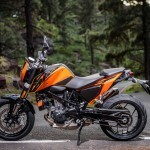 The Duke was the company’s first street bike, and the meaty center of the 2016 Duke line is filled with that first Duke’s direct descendants, the 690 Duke and 690 Duke R.
The Duke line shares the same basic equation that launched KTM on its trajectory from dirt specialists to to including a range of street motorcycles, which has now become Europe’s largest motorcycle manufacturer. 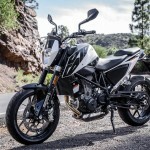 The Duke started with an off-road chassis and put it in street trim that was able to capitalize on the strengths of the light, upright, quick-steering motorcycle. Not much has changed with the latest Duke, and yet, everything has. 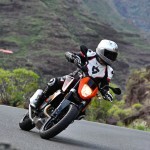 In performance-oriented, two-wheeled motorsports, the quest for more power and less weight is almost religion. 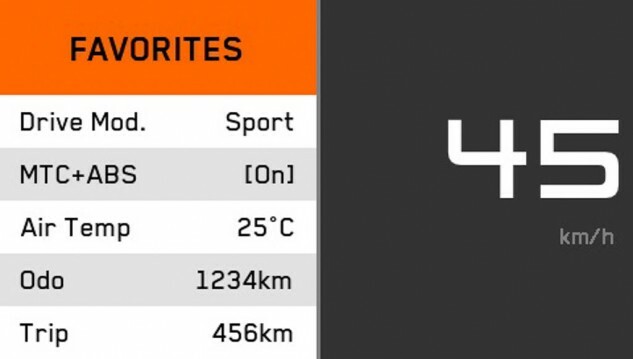 However, the design goals for the LC4 extended beyond these to include broadening the powerband, providing better rideability, meeting Euro 4 emissions standards, and – most importantly for a big thumper – minimizing the single-cylinder’s inherent vibration. 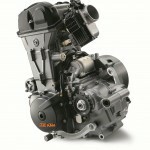 Looks like a DOHC engine, no? The angle of the head/cam cover interface is visible here. When mounted in the chassis, the LC4 may only look a little different from the previous generation, but there are almost no parts shared between the two. Perhaps the most noticeable change to the LC4 is the top end, which, at first glance, appears to have changed from a SOHC to a DOHC arrangement. 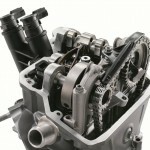 Yes, the new, silent timing chain is rotating a pair of sprockets, but only one is connected to a camshaft. This relocated camshaft has moved from its previously more central position back towards the intake side of the head. 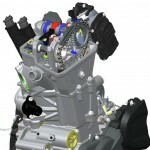 The front side of the head, where one would typically find the exhaust cam, has a secondary balance shaft that works in conjunction with the crank-driven balance shaft to quell vibrations. 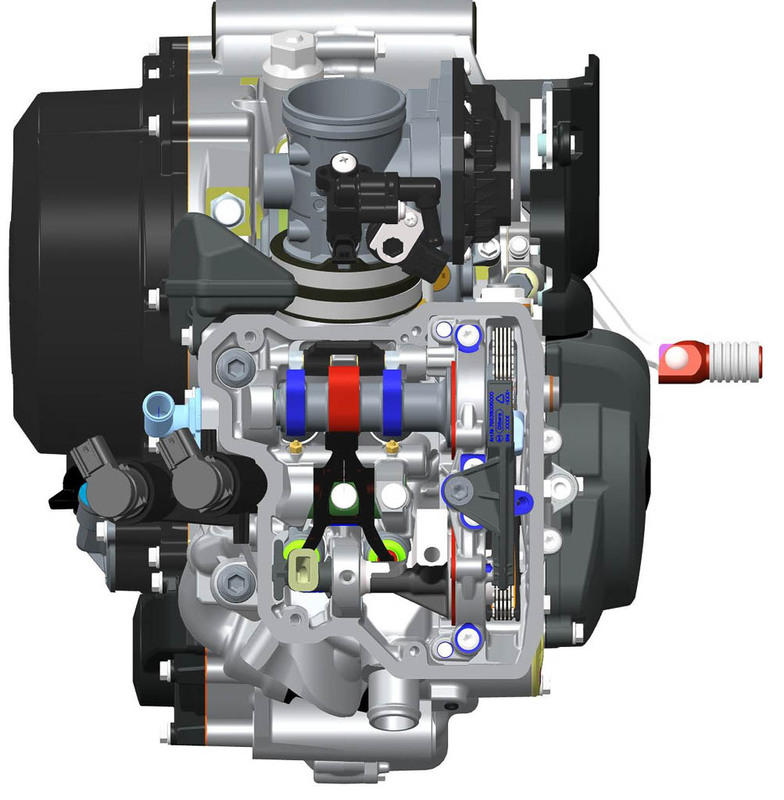 The single camshaft utilizes three lobes to actuate the valves, with the two outer lobes directly opening the intake valves while the center lobe controls a dual-fingered rocker arm to take care of the exhaust valves. Some clever engineering makes it possible to check and adjust the valve clearances without the time-consuming labor of removing the cam. Additionally, the chances of accidentally altering the valve timing by skipping a tooth in the timing chain while reinstalling the cam is eliminated. 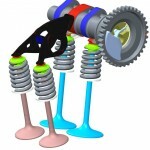 The intake cam lobes are in blue while the exhaust rocker’s lobe is red. The exhaust valves are actuated by the two black fingers reaching below the secondary balance shaft. The head has an angled mounting surface for the cam cover rather than the typical flat one. This allows for weight savings by reducing the comparatively heavy aluminum alloy of the head and replacing it with the light, 2mm-thick magnesium cover. Just three bolts secure the cover, shaving additional grams. The connecting rod is lighter and smaller for less reciprocating mass. Plain bearings reduce frictional losses. The top end isn’t the only place where parts were changed to decrease vibration. 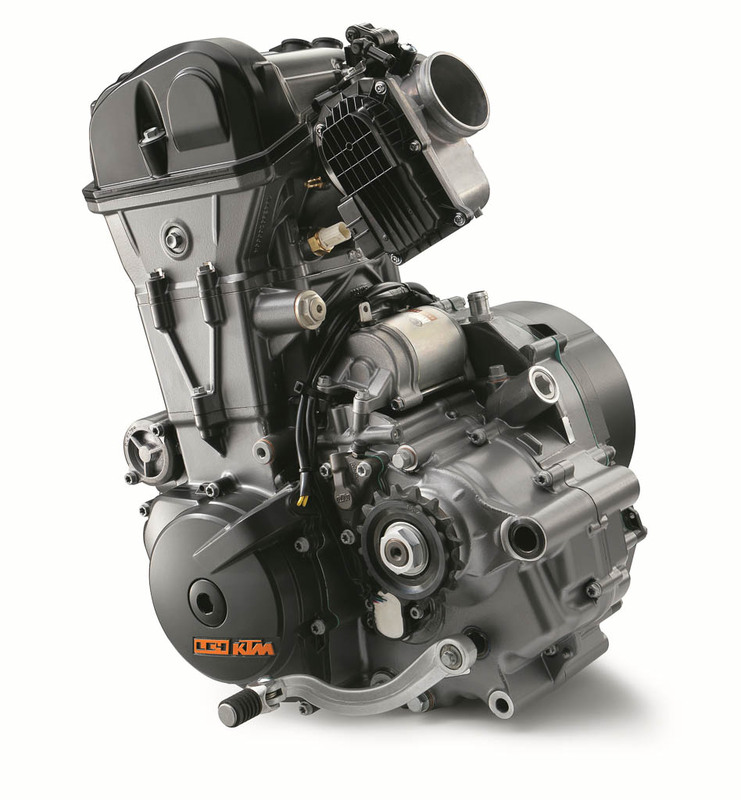 The cylinder bore increased by 3mm to 105mm, while the stroke dropped 4.5mm to 80mm, maintaining the 693cc displacement. 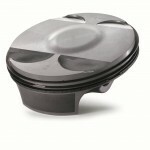 While the forged piston is larger, its weight didn’t increase. When added to the new lightweight, more compact con-rod, the result is a decrease in the oscillating mass of the piston/crankshaft assembly. 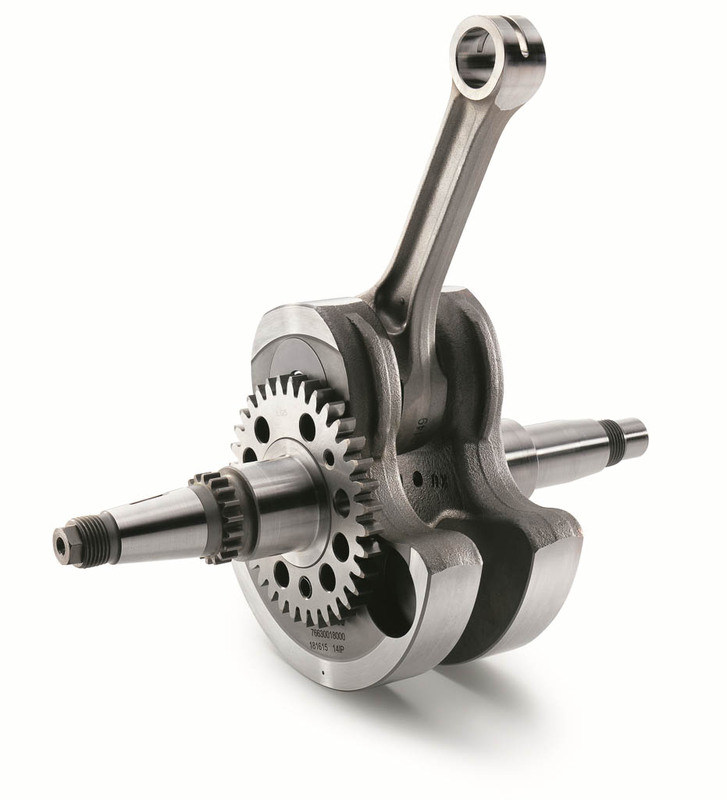 Coupled with the friction reduction of the crank’s plain bearings, these changes not only reduce vibration, but also help bump the power output while increasing the engine’s reliability. In addition to the internal engine changes, the power delivery is massaged by the 50mm ride-by-wire throttle body and the resonator chamber attached to the intake tract which helps tune the power pulses within the engine. 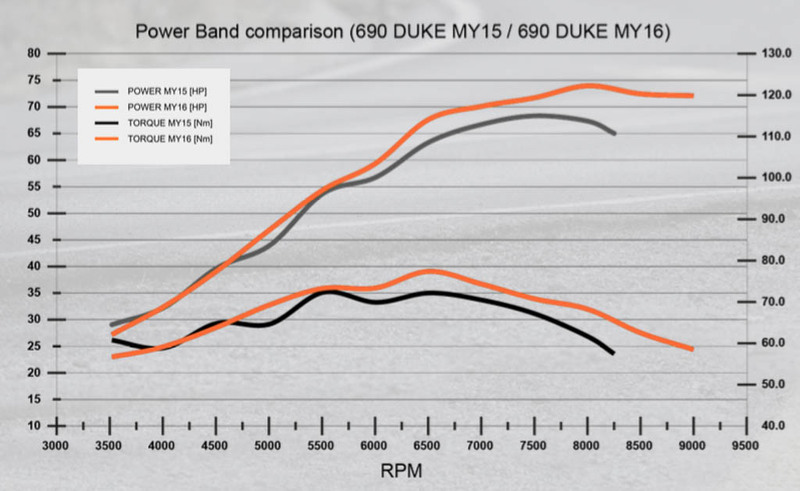 When combined with the ride-by-wire throttle and dual spark plugs (with separate ignition maps for each plug), the resulting power production (a claimed 7% increase to 73 hp and a 6% gain in torque to 54 lb-ft) comes across the entire rpm range and has had its rev limit increased by 1,000 rpm. 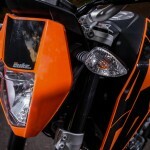 All this doesn’t come, according to KTM, at the expense of fuel economy or emissions. 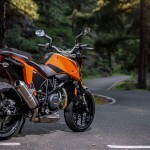 The 690 is now Euro 4 homologated. The new engine produces more power with a smoother curve than the previous generation. 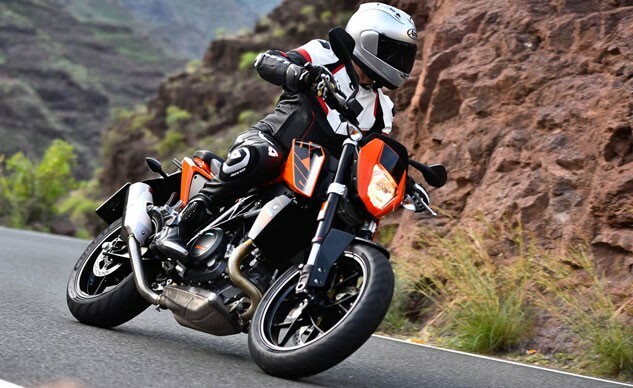 Although the previous generation 690 had R-b-W, it didn’t take advantage of the electronic aids the technology makes available: ride modes and traction control. 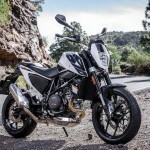 With the 2016 690 Duke, that issue has been addressed. 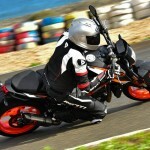 The standard 690 receives the Street ride mode, while the optional €299 ($317) Track Pack adds Sport and Rain modes. In Rain Mode, the power delivery is softened to account for the lessened traction of the road surface. 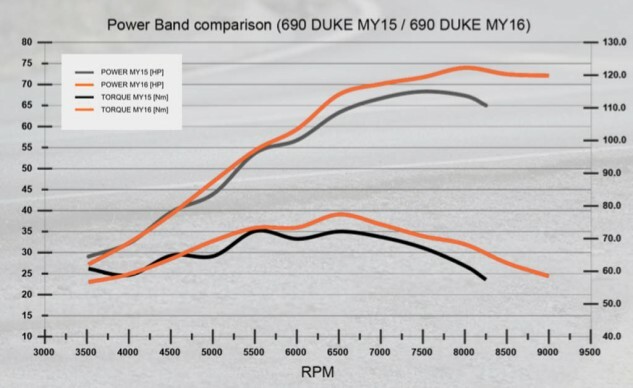 Sport and Street modes deliver the same peak power, but the throttle response in Sport is more direct. 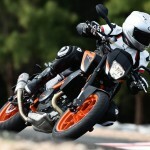 KTM also adds a two-channel Bosch 9M ABS system with an optional supermoto mode that disables ABS for the rear brake only. 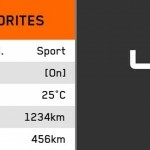 The Favorites menu makes changing ride modes while riding a snap. TC is included with and linked to the ride modes. 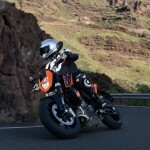 While all three ride modes use TC to arrest rear wheelspin, Sport allows for more slippage before it intervenes. Working in a similar – but opposite – manner, Motor Slip Regulation (MSR) prevents rear wheel skip or slide under sudden deceleration or abrupt downshifts by slightly increasing the engine speed. While this may seem to be unnecessary on a bike that includes, new for this model year, a slipper clutch, we expect a form of MSR to become the more common tool to limit wheel skip in the not too distant future. 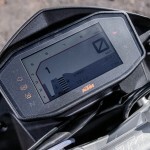 The Duke’s instrument cluster has been replaced with a color TFT dash. Aside from the more modern look, the display has the flexibility to deliver different, situation-specific screens. When you see red, it’s time to think about shifting. 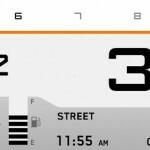 For example, the bar-graph tachometer is blue when the engine is cold and changes to black once it is close to operating temperature. 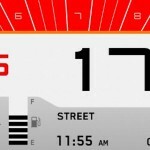 At high-rpm operation, both the gear indicator and the tachometer turn red, acting as a shift light. The screen also changes colors based on light intensity. During the day the background on the screen is a light gray with black digits. At night, the colors switch to white text over a dark gray background. 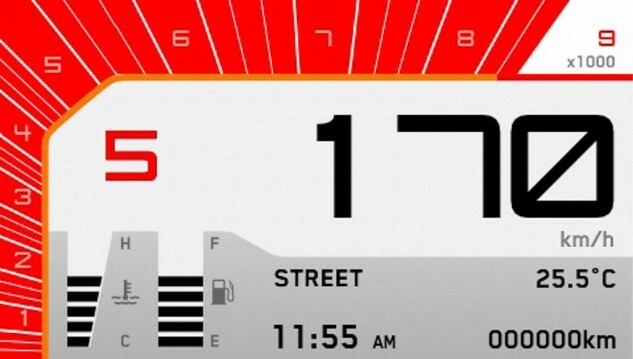 In use on the road, all the important information, such as the rpm and speed, can be easily read regardless of the lighting conditions. However, in some daylight situations, sorting out the smaller text at the bottom of the screen can be a challenge. 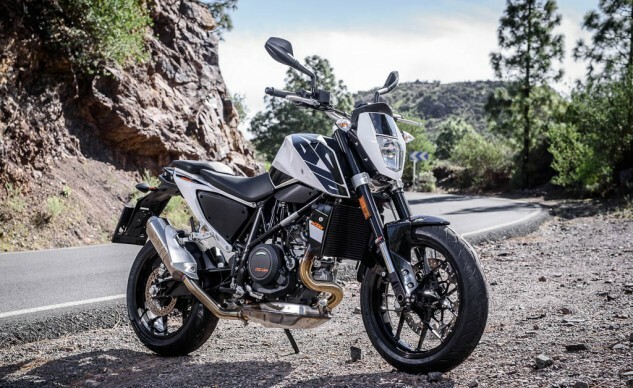 Even though the main tubular trellis frame remains unchanged, the chassis did receive some key upgrades aimed at refining the 690 Duke’s signature sporty-yet-versatile handling. Duke cognizanti may notice that the forged triple-clamp is new with an offset which has been decreased 4mm to 28mm, increasing trail 7mm to bring the figure to 4.8 inches. 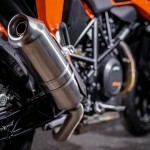 KTM states that the clamp stiffness has been tuned to match the 690’s non-adjustable 43mm inverted fork. A single WP shock supports the rear and is preload adjustable. The result is a suspension that is versatile enough to handle a wide variety of riding situations while retaining its characteristic sportiness. Despite the lack of adjusters, the Duke’s WP fork works quite well. The brakes follow a similar path. 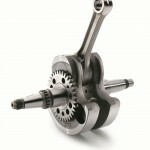 A single, floating 320mm front disc has the pleasure of being clamped by a radially-mounted, four-piston Brembo caliper. The rear disc measures 240mm with a floating single-piston caliper providing the slowing force. A pair of 17-inch wheels with Metzeler M7RR rubber connect the chassis to the pavement. Constructed of cast aluminum, the wheels feature a 10-spoke design with the widths measuring 3.5 in. up front and 5.0 in. in the rear. Tire sizes are 120/70 17 and 160/60 17, respectively. 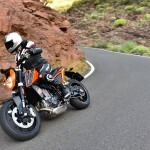 Way back at the start of the article, you may remember that this is supposed to be a review of both the 690 Duke and the 690 Duke R. Well, they are essentially the same with a few exceptions that should be noted. 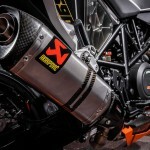 The Duke R’s claimed power output is 2 hp higher at 75 hp, thanks to the street-legal Akrapovic titanium slip-on muffler. 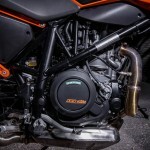 In addition to increasing the engine’s power and giving noticeable deepening of the exhaust note, the upgraded muffler shaves 1 kg (2.2 lb.) off the bike’s weight. To help the rider take maximum advantage of the power bump, the features of the Track Pack are included in the R and are augmented by the Motorcycle Traction Control (MTC) that adds a lean-angle sensor, allowing the MTC to tune its response to the chassis attitude. 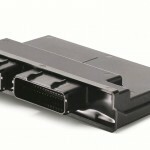 The lean-angle sensor also feeds information into the Cornering ABS and MSR systems. 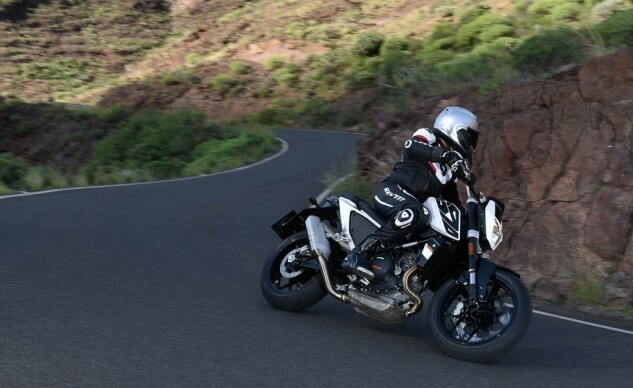 The Motorcycle Stability Control module links the with the ABS and TC to take lean angle into account when utilizing those systems. Naturally, the brake and suspension components get an upgrade. 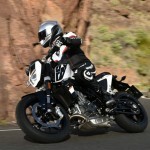 The front caliper becomes a Brembo M50 unit like ones for which EiC Kevin Duke has publicly declared his love (here and here) when mounted on other motorcycles. 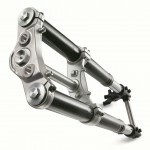 The triple clamp is machined from aluminum. The fork sprouts adjustments for preload, compression damping and rebound damping, while the shock also gains full adjustability. Additionally, 15mm of travel were added to both the front and rear suspension. The Duke R has special colors, like an orange trellis frame instead of black. You may be thinking that all these improvements sound pretty good, so where’s the tragedy? 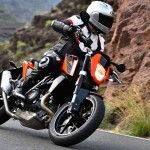 The 690 Super Duke R will not be available in the United States. 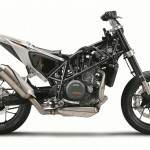 A KTM rep said it is purely a numbers-based decision, and the company feels that the increase in cost for the Duke R, roughly €2000 ($2,118), would make it a hard sell in the U.S. 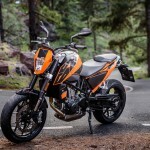 The 690 Duke R, not for the U.S. market. 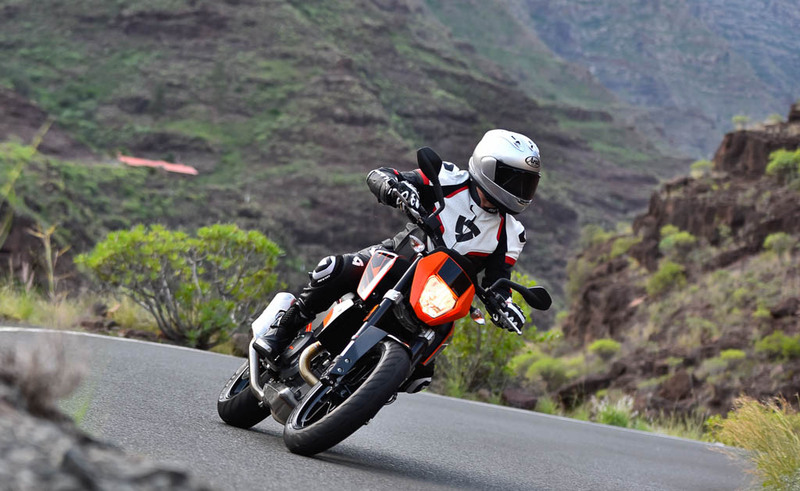 The 690 Duke has always been a strong performer thanks to its light weight. 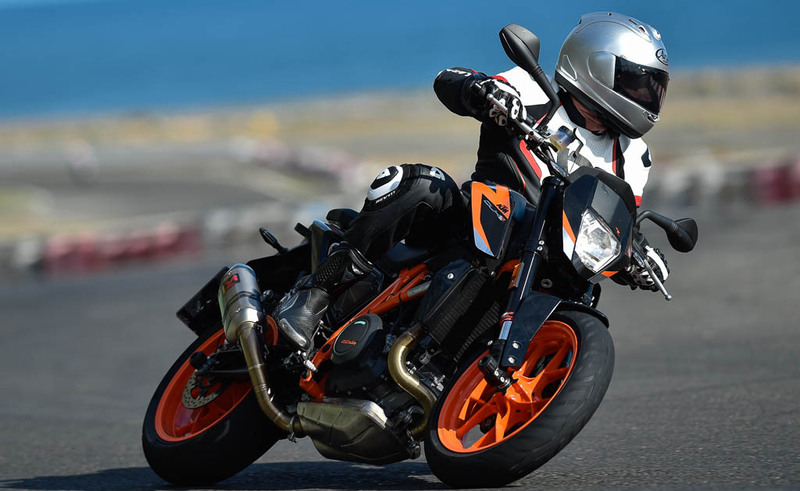 Couple that with a narrow profile and snappy steering, and you’ve got a sporty bike that excels where larger-bore sportbikes fear to tread. 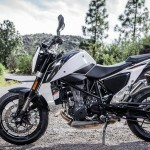 Before taking a look at the Duke in exciting situations, consider the mundane chores that a well-loved motorcycle is often subject to. 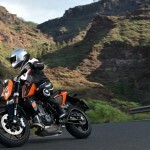 The upright, relaxed riding position on the Duke lends itself to urban use. 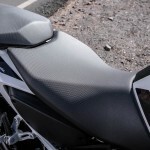 The rider’s sight line is above the majority of vehicles it encounters, while the riding position and ease of maneuverability make quick work of navigating urban snarls. 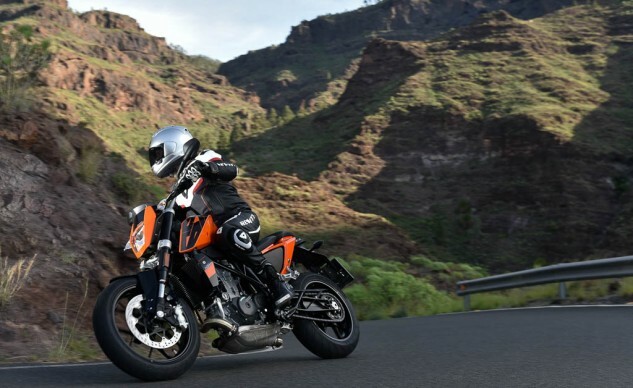 What has previously stood in the way of the 690 Duke was its engine’s ever-present vibration. 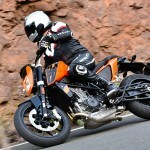 Around town, the 690 has always had a torque-filled bottom end, and this hasn’t changed. Lugging along in low-speed morning traffic in first gear, the easy-to-modulate clutch and the responsive throttle make it obvious that the 690 Duke can be a great commuter bike. The user-friendliness of the power delivery – particularly the smooth throttle response in Street Mode – could make the Duke a palatable choice for a performance-oriented new rider, giving him/her a bike that won’t be outgrown immediately. The 690 Duke has always been at home on tight, undulating roads, but its horizons have expanded to include highways. The fuel metering provided by the 50mm throttle body is spot-on in most conditions. 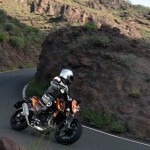 Street Mode provides smooth transitions in off-on-off-on conditions encountered during the press ride on the narrow, twisty roads of Grand Canaria island where the Duke introduction was held. 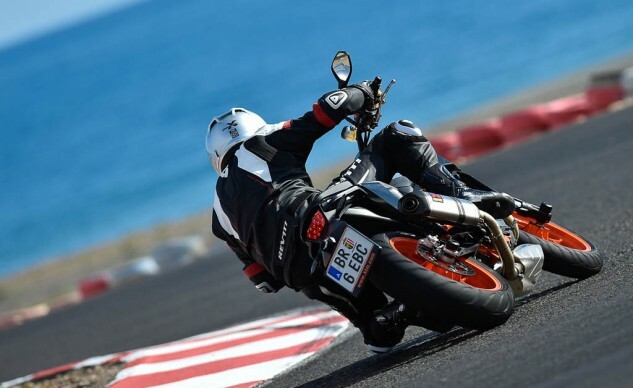 Sport Mode provides snappier throttle response which worked quite well in higher speed, high-rpm situations, but when the roads got really tight and technical – think lower-rpm first-gear corners – I preferred the less instantaneous transitions of Street Mode. Because of the Favorites menu, switching ride modes on-the-fly was just a couple button-pushes away. 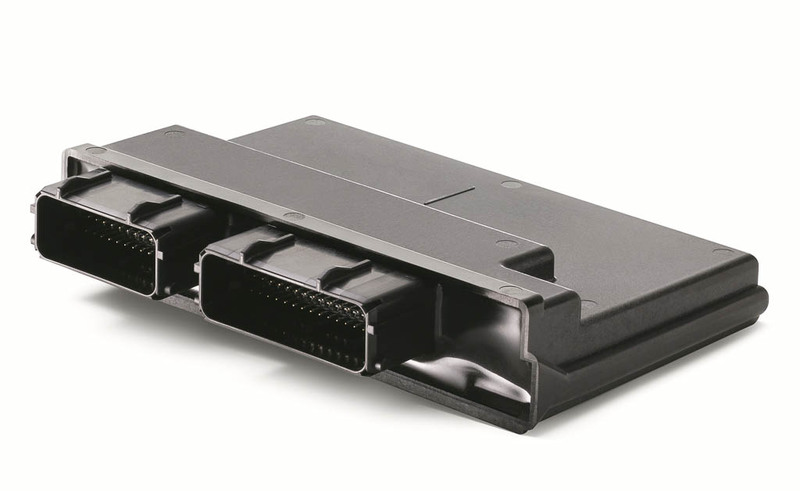 I could quickly – from memory – switch modes on the road with just a quick glance down to confirm the change. 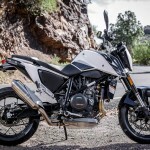 While the non-release of the Duke R to the U.S. market is upsetting, that can’t take away from how well-sorted the standard Duke’s non-adjustable front and preload-adjustable rear suspension is. Throughout the ride, depending on the current road conditions, the biggest criticism I could come up with was occasionally thinking that I’d like a click or two more rebound damping on a few sections of road. Of course someone who is either heavier or lighter than my 190-lb. frame – with gear on and a belly full of press-intro food – may wish for some adjustability. 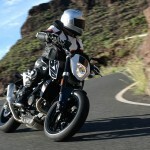 The ride is decidedly sporty, and in some situations with broken pavement, it bordered on harsh. Still, I’d rather have the suspenders err on the side of sportiness for fun rides. 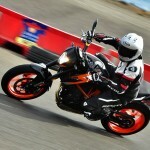 Stock suspensions are always an exercise in compromises, and KTM seems to have hit a sweet spot with the 690 Duke. 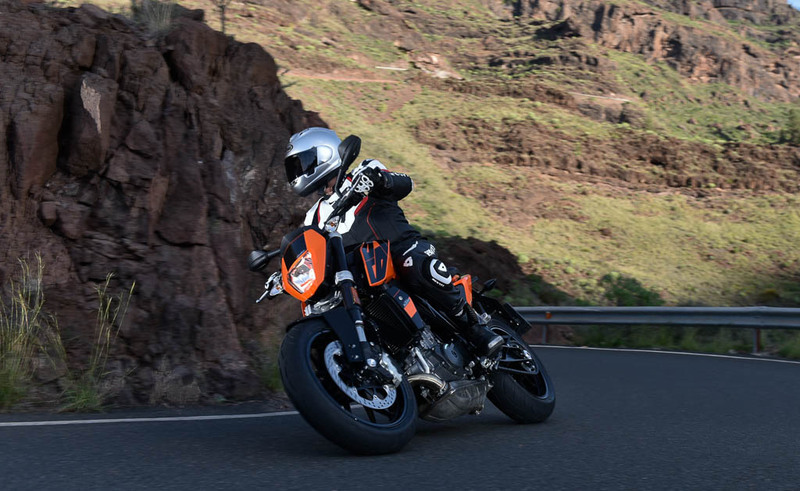 Steering response from the new 690 Duke is exactly what it has always been, precise and immediate. The bike’s approximately 350-lb. weight (calculated from claimed dry weight plus 3.7 gallon fuel load) plays an important role here. 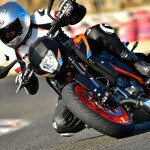 However, the increased trail does contribute to a slightly more stable personality in higher-speed sweepers. 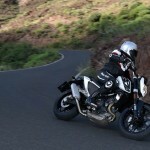 The Duke is a bike that lives to go around corners and craves extended sections of side-to-side transitions. Having a willing engine that offers plenty of grunt in the bottom end but still ramps up the horsepower to just before redline is a great accomplice to unwinding a twisty road. With the new smoothness of the mill, the extra 1,000 rpm is quite useable and appreciated. Only during the track sessions on the Duke R did I encounter the rev limiter unexpectedly – mostly because of the close proximity of another rider taking a bit of my attention. The slipper clutch and MSR provided silky-smooth downshifts – even at high-rpm, near-redline drops into first gear that had previous Dukes chirping. The 320mm front disc and the standard Brembo caliper offered plenty of power and feel, though it may not be as swoon-inducing as the M50 caliper. The ABS was seamless when invoked. One particular instance that had me grateful for ABS occurred at the entry to a downhill first-gear corner. Diving into the corner, hard on the brakes, a compression bump lightened the back wheel just as I initiated the turn. Although I’m experienced enough to have modulated the rear brake as the tire chirped, the whole process was much less dramatic with the ABS stepping in for a moment to assist. I simply felt the gentle pulse in the pedal and made a mental note to use this event in this story. Given the Duke’s dirtbike roots, the 32.9 in. seat height shouldn’t be a surprise. (The Duke R bumps it up to 34.1 in.) Still, the height may be off-putting to new riders. The narrowness of the engine and the seat help a bit, but shorter-legged folks will be on their toes. Speaking of the seat, it is super firm but did not bother my finely-tuned hind parts. 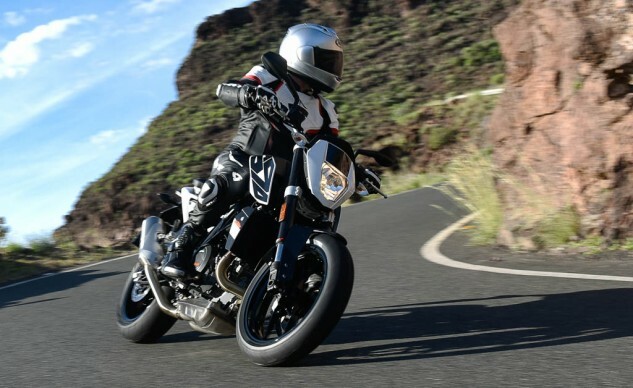 It’s narrowness made sitting forward against the tank natural and comfortable in the tight-n-twisty stuff, but the length of it allows the rider to slide back on the highway to get a little forward lean to combat the wind. 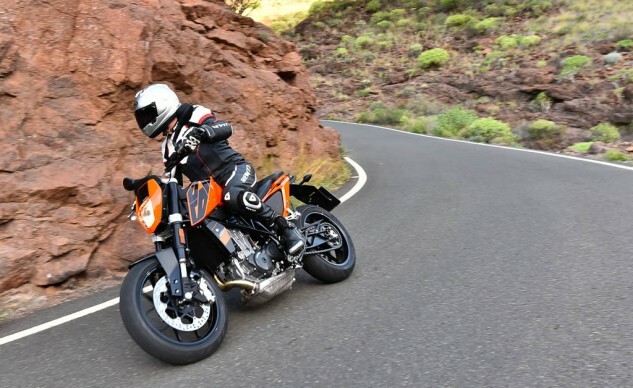 The 690 Duke has truly broken new ground in the area of smoothness in single-cylinder engines, making it a bike that is desireable for more than just its impressive cornering ability. 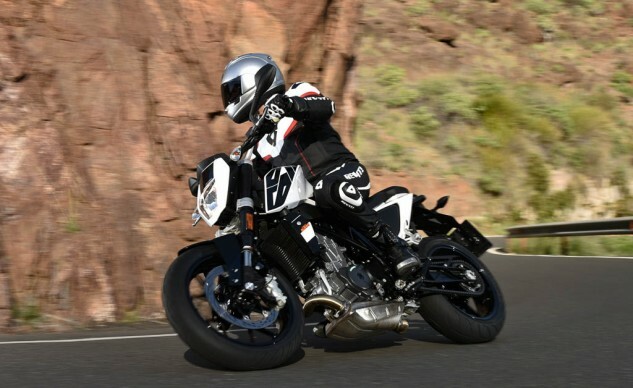 The 2016 690 Duke will be available “spring-ish” in dealerships for $8,999 – the same price as the previous version. 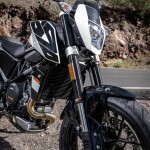 The color options will be orange and white, and the standard Duke will be recognizable by its black frame (not that there will be any orange-framed Duke Rs around to compare it to). No Duke R in the U.S.